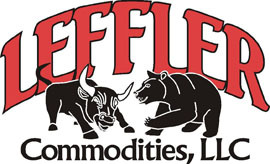 Leffler Commodities, LLC. is headquartered in Augusta, Kansas with a branch office (dba Frontier Ag) located in Quinter, Kansas. We are a commodity futures and options brokerage firm, a registered commodity trading advisor and an agriculture marketing advisory service. We clear our trades through and are a guaranteed introducing broker of ADM Investor Services, Inc. ADMIS has been a leader in the futures brokerage industry for more than 40 years. We focus on our futures and options trader’s success by assisting clients in determining appropriate stop loss points and using money management. We also have a working releationship with The Nesvick Trading Group, LLC., an Introducing Broker, in Germantown, Tennessee a suburb of Memphis. They provide us with additional marketing research and information. Nesvick Trading Group also provides Leffler Commodities access to a number of registered Commodity Trading Advisors and other traders. Leffler Commodities has the capabilities to meet the needs of its diversified clientele including small to large farming operations, cattle feeders, feed yards, hog producers and grain elevators. We have a great program for agricultural risk management and marketing through a joint venture with Leffler Ag Consulting, LL. The combination of Leffler Commodities and Leffler Ag Consulting years of experience enables us to fulfill our clients' requests with knowledgeable trusted advice.